This new book from Arthur Middleton Hughes and Arthur Sweetser confronts you with a stark choice. Do you want to continue doing things the “old” way, and see results fade under the weight of email fatigue and new marketing channels? Or do you want to turn your email marketing into a highly profitable, future-proof channel that builds strong and lasting customer relationships? The answer is obvious, but most advice out there already promises help along these lines. So does “Successful email marketing strategies” offer anything different or better? The main premise of the book is to increase your email marketing success by building the kind of loyal customer relationships the corner store used to have. Not through force of personality, but through collecting, recording, appending, analyzing and using data. The initial chapters set out the theoretical and financial argument for moving to a data-driven email model. Most of the rest of the 373 pages then detail procedures and strategies that help you understand exactly how you might implement such a model. Importantly, the authors talk about much, much more than “traditional” email data, such as open rates. Instead, they address the role of a wide range of appended data available from other sources (both inside and outside the business). That’s where the vast majority of email marketers need help. Topics covered include measuring “campaign” and “subscriber” performance, calculating the value of an email address, transactional emails, trigger emails, detailed segmentation techniques and using web analytics. As such, it’s not a beginner’s guide. Nor does it cover the basics of email marketing. Instead, it’s the ideal book to buy after you’ve read one of those more general books. 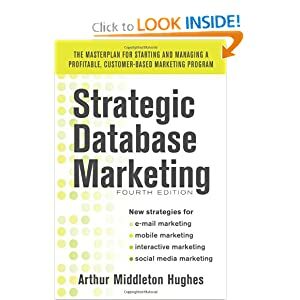 And even if you’re not familiar with database marketing, the text does a good job of persuading you why you should be looking into the wider application of customer data. 1. The book communicates very clearly the value of data and metrics. This might just be the kick you need to tackle that area in terms of day-to-day practices and long-term strategic change. 2. The book is very different to existing email marketing texts and opens up many new perspectives not covered in such depth elsewhere. For example, the authors argue that data is so valuable that it makes sense to sacrifice a few sign-ups for the sake of collecting more information: particularly the kind of info that can then be used to append consumer and business data from commercial sources. 3. While the focus is on direct sales, there is plenty of encouragement to think of email as a brand builder and driver of offline action. The authors even explore methods for measuring offline sales. 4. The benefit of focus is that the book goes into detail. Rather than vague enjoinders to “improve relevancy,” for example, you actually get a step-by-step plan for measuring and improving relevancy in practice. 5. The material covered is not stuff you can pick up free on the web in 700-word articles. Much of the information will be new to those in email marketing. 6. Many case studies and sample calculations really bring home the points being made. 1. The target readership is definitely those looking to actively drive sales, with a strong focus on B2C. While many lessons are applicable to B2B and content-based publications, they receive little direct attention. 2. It’s a valuable read, but not always an easy one and is a touch disjointed in places. 3. The book is strongest in those chapters dealing specifically with data-related issues, but there is coverage of other (related) areas, such as subject lines, copywriting and frequency issues. My summary: Not the first email marketing book you should buy, but absolutely indispensable if you know your basics. The book is available from the publisher’s website.